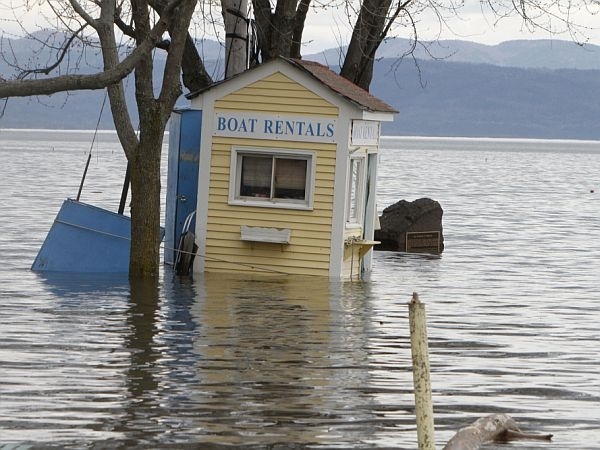 Lake Champlain is at historic flood levels, and many parts of the state are dealing with flooded rivers and streams. A lingering snow pack and warm heavy rains have contributed to the flood conditions, but the impact of all this water is also related to how we develop and use land adjacent to rivers and lakes. We talk with two scientists from the Department of Environmental Conservation about what happens when a watershed is inundated with large volumes of water, and what the implications are for flood plains, riverbank erosion and phosphorous-laden sediment flowing into Lake Champlain. Our guests are Mike Kline, head of River Management for DEC, and Neil Kammen with the Water Quality division of DEC.
Also in the program, we talk with Brian Till of Jericho. The 26-year-old is publishing his first book, "Conversations With Power: What Great Presidents and Prime Ministers Can Teach Us About Leadership." It’s based on Till’s face-to-face interviews with more than a dozen world leaders of the last 30 years, who reflect on what they learned while governing. The book includes interviews with Bill Clinton, Pervez Musharraf, Mikhail Gorbachev and others. And the world of hip-hop and rap music is being leveraged to help at-risk youth in the Upper Valley. Music contributor Matt Bushlow reports on how rap music is being used in a new court diversion program for teens. Rap and hip-hop have a mixed reputation: misogyny and violence have long been a part of the genre, but the music has also given a voice to underprivileged Americans since the late 1970s. Recently, it’s helped some kids in the Upper Valley come to terms with difficulties in their lives. Music contributor Matt Bushlow has this story of how rap music is being used in a new court diversion program for at-risk youth.